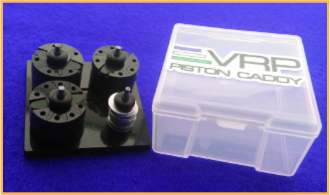 This is a set of (12) Patent-Pending VRP 'XV3 Pistons' - (4) 5 Hole 1.5mm, (4) 6 Hole 1.3mm, (4) 8 Hole 1.3mm, inside a Free Piston Caddy. These are the most popular sizes all in one kit. The pistons come complete with the Transition Valve pre-installed. The Rebound booster hole has been precision drilled to the exact size our testing found to be the best 'all around' setting. This yields excellent results that are proven on a variety of track surfaces. From rough, blown out tracks, to smooth, indoor clay, the VRP Piston makes a positive difference and gives you a Big Advantage over the competition! Used by the Pros because they are Simple to understand! The Pistons are designed to increase the Rebound only. They do not change the compression from what you would have running stock pistons. No crazy set up changes. No scratching your head if they work or even made a di?erence. Anyone who has run them will tell you it was better from the moment they squeezed the trigger! No questions! ....Amazing! *Important: The VRP ‘XV3’ Pistons are designed to have a washer under and over them. It is important to run washers and that they are correctly installed. Each set of pistons is supplied with a Washer Hardware Pack to make sure you have what you need to install them. 1. - You will feel a difference in the piston because it is designed for the oil to flow through the holes instead of around the perimeter. We suggest starting with the normal oil you would use for this piston size (30-35wt). Remember, the compression stroke stays the same, only the rebound is quicker. 2. - There is an Optional ‘Hard’ Valve to use for High Temp, or High Bite Tracks. Simply pull the Stock Valve out and insert the new Valve.